Everyday Paleo is written by Sarah Fragoso, a trainer at the Norcal Strength and Conditioning gym, operated by Robb Wolf, author of the Paleo Solution. Fragoso, who is also mother of three children ranging in age from three to fifteen, initially created a blog about the Paleo Diet as a way to connect with others in the online community who were experimenting with this way of eating. Her book is an extension of the information on her blog and is focused on the practical challenges of implementing this diet into the lifestyles of busy families. The book commences with a simple explanation of the Paleo Diet and how this way of eating can improve the health of the whole family. As an active mother of three kids, Fragoso acknowledges the difficulty of implementing a dietary change, and she focuses on providing practical advice to make the transition smoother. Her goal is to help you to lose weight, improve health and fitness with a focus on getting the entire family involved. She explains how to get your house ready for Paleo eating with information on what to shop for, the items to keep in your pantry and how to prepare Paleo foods. This simple paleo diet even contains suggestions for school lunches. In addition to the information about diet and recipes, Fragoso highlights the importance of managing stress and getting enough sleep. She emphasizes that diet is just one element of staying healthy and it is necessary to pay attention to these other factors, as well as leading a physically active lifestyle. Spinach, cabbage, tomato, squash, zucchini, onion, apples, berries, banana, chicken, beef, lamb, pork, mahi mahi, shrimp, scallops, eggs, coconut oil, avocado, almonds, pecans, walnuts, raw honey, cinnamon, dark chocolate. This Simple Paleo Diet includes a simple exercise program, which is appropriate for all levels, with illustrated descriptions of functional training exercises. This involves activities that engage the entire body in a natural way and require little or no equipment. Sections are provided outlining how to exercise while looking after your children, or with a partner, so you can get in shape together while bonding at the same time. There are also tips on how to encourage your kids to get outside and stay physically active. Photos of children demonstrating exercises are also included. Everyday Paleo retails at $29.95. Easy to read and provides a simple explanation of the concepts of the Paleo Diet. 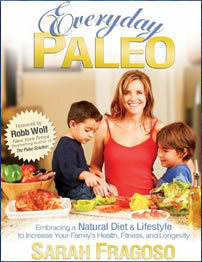 Gives tips about making the Paleo Diet work with kids and a busy lifestyle. Recipes will appeal to everyone in the family. Includes a photo of every meal. Does not provide an in-depth discussion of the science behind the Paleo Diet. Very restrictive and requires the elimination of a wide variety of foods including whole grains, legumes, dairy products, caffeine, alcohol and sugar. The initial adjustment period may be challenging for many dieters. Requires a fair amount of time for shopping, meal planning and food preparation. Everyday Paleo is a recipe book and lifestyle guide that outlines the basics of a simple paleo diet with a focus on getting the whole family involved. It includes a wide selection of family-friendly Paleo recipes combined with practical tips to help those with a busy daily routine to experience the benefits of this way of eating.